Home » About Us » News » LSBU Student Teambuild activity is a roaring success! LSBU Student Teambuild activity is a roaring success! Sixty undergraduate and postgraduate students from the School of The Built Environment and Architecture at LSBU took part in the competition to learn more about the discipline they are studying, along with gaining essential skills ranging from teamwork to confidence building. Teambuild is a cross-disciplinary construction competition organized by charitable trust, the Teambuild Association, since 1992. Students who signed up were allocated to multi-disciplinary teams and asked to complete a series of tasks based around a real construction project – from the master plan, outline design, procurement, to construction – in a 48-hour period. Over the course of the weekend, each group was required to make a series of presentations which were assessed by a team of judges drawn from industry. LSBU Professor of Building Systems Engineering Andy Ford said: "I'm delighted for LSBU to be involved in such an innovative project, which not only helps our students gain vital skills applicable to their line of work, but also teaches them the importance of fellowship and teamwork. We hope that this project can be replicated in the near future and more LSBU students can be inspired in this way." "LSBU was a natural home for our competition, at the forefront of interdisciplinary education in construction. LSBU students embraced the challenges and showed excellence in collaboration boding well for the future of our industry. 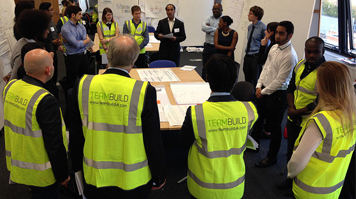 We're delighted with what we managed to achieve with LSBU," Alex MacLaren from Teambuild UK added.